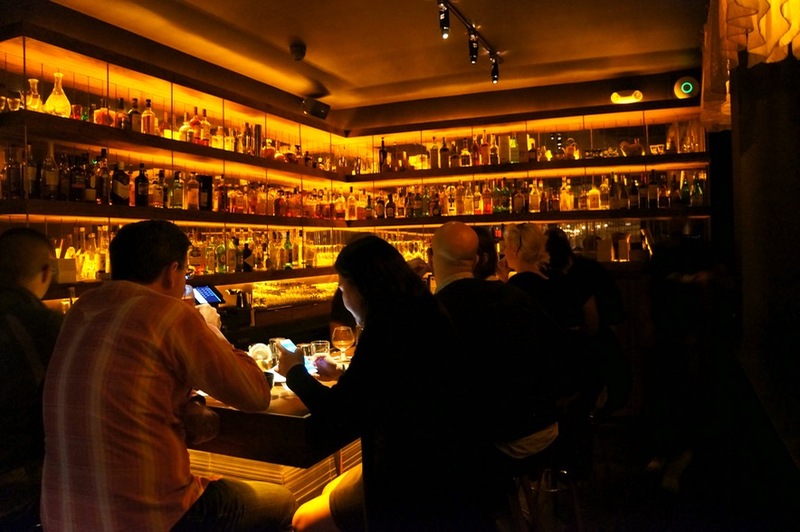 After spending seven years at Pegu Club honing his craft, bartender Kenta Goto opened up his own bar last year. 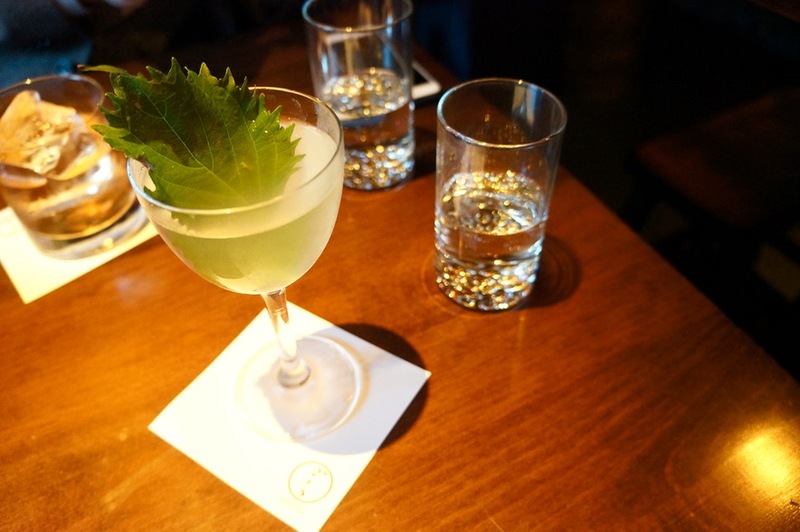 While there’s certainly no shortage of cocktail bars in Manhattan, what separates Bar Goto (@BARGOTO_NYC) from the rest is its Japanese twist on cocktails and bar snacks. Located in the Lower East Side, just south of Houston on Eldridge, this cozy bar is tough to spot. The exterior is all black and lacks signage. So, keep an eye out! We arrived around 5:30 on a Saturday for pre-dinner drinks and snacks. They open at 5pm and already there weren’t any seats at the bar. There are a handful of tables in the space as well, so we made ourselves at home at one of them. 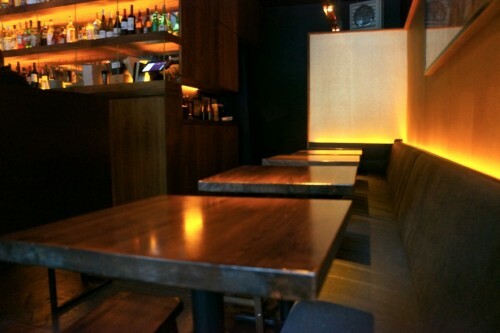 The space is dark and sleek with a warm and inviting atmosphere. The bar is beautifully lit with a warm glow while the rest of the space is fairly dark. It makes for a nice date spot! Bar Goto was listed on Bon Appetit’s Top 5 Best New Bars in the US in 2016 so we were eager to see what they had in store. 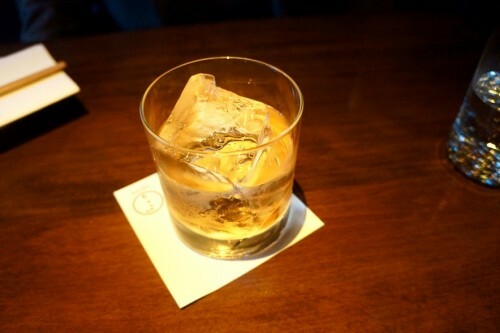 All their cocktails are priced at $15 each and most of them feature Japanese ingredients like the Umami Mary with miso and shiitake, the Yuzu-Calpico Fizz and Sake nectar. We tried the Jersey Kilt – scotch, Applejack plum bitters, Plum Sazerac – bourbon, Slivovitz, Absinthe, Far East Side – sake, tequila, shiso, elderflower, lemon, yuzu bitters and Sake Nectar – sake, gin, lemon, lychee, Asian pear. The first two drinks (the boozier drinks) were ordered by Mike and while he thought they were both fine, he didn’t think they were particularly inventive. With all the hype, he just expected more from ‘one of the best bars in the US’. 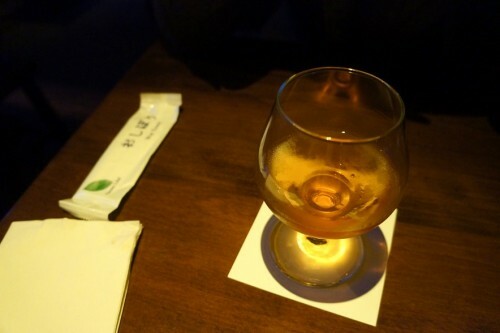 If you’re looking for a lighter drink, the Far East Side would be a good bet. Even though there’s tequila in it, it’s not overwhelming and was overall very light and refreshing – great for a pre-dinner drink. The Sake Nectar is another good light option. I was a little hesitant about ordering this since it has lychee in it (not a big fan after a couple bad nights of Soho liqueur in University) but our server convinced me it wouldn’t be too overpowering nor would it be too sweet. He was right on all counts! Food is an absolute must at Bar Goto. While it’s a ‘snack’ menu, you could easily make a meal out of it as well. 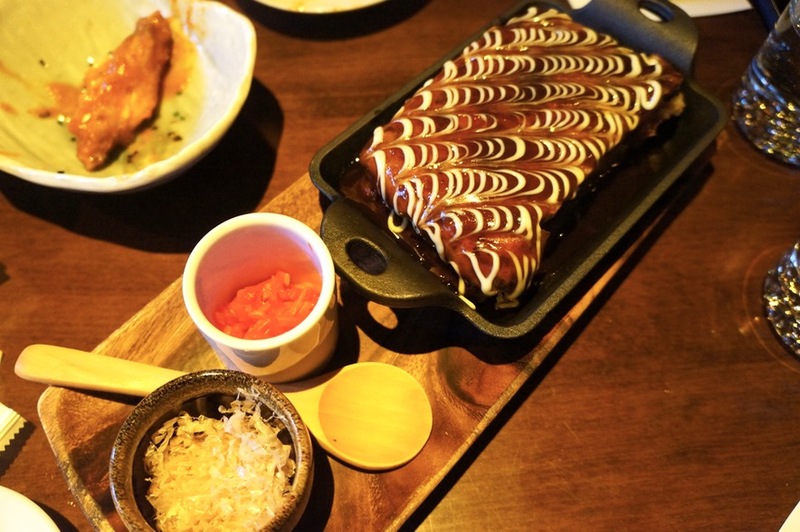 Dishes include small snacks like house pickled local vegetables, gobo French fries (fried Japanese burdock roots) and okonomiyaki. When I say food is an absolute must, I really mean the wings are an absolute must. 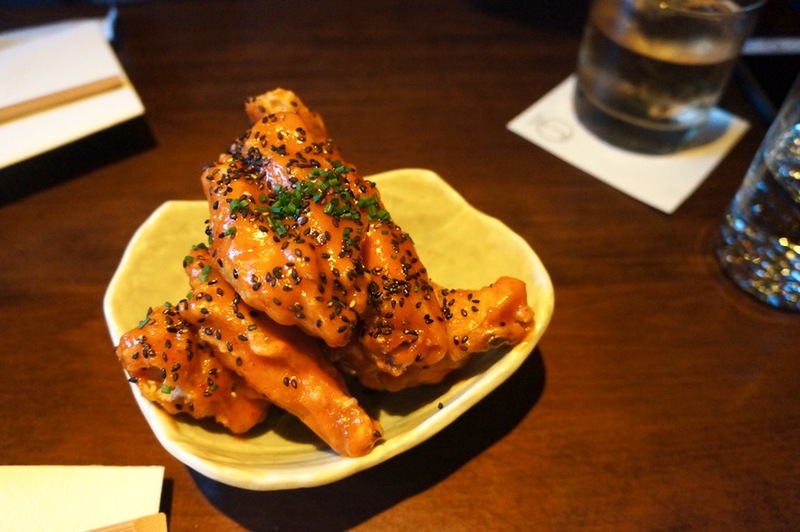 Unless you’re a vegetarian, there’s no excuse not to order the Miso Wings – chicken wings, black sesame, scallions, house spicy miso sauce ($12). Once you smell them arriving at the table next to you (and you will, because everyone orders them), I can bet you’ll immediately be flagging the server down to get your order in too. The sweet and savoury wings were super crispy on the outside, juicy on the inside and extra saucy, exactly how I like ‘em. The only downside is that the chicken wings they use aren’t very meaty. Bar Goto offers several variations of Okonomiyaki – savory cabbage pancake served with okonomi sauce, Kewpie mayo, dried bonito flakes and pickled red ginger. The classic (pork belly, rock shrimp, squid, parmesan and yakisoba), carnivore (chicken, pork belly and smoked bacon) and herbivore (shiitake, shimeji mushrooms, scallions, pickled mustard greens, konnyaku and red chili) are all $12 each while the fisherman’s (squid, sakura shrimp, rock shrimp, kombu and nori) is $13. You can also add a sunny side up egg to any of them for an extra dollar. This is easily one of the prettiest presentations I’ve seen of this dish. They are served in a little cast iron skillet and the kewpie mayo and okonomi sauce top the pancake in a beautiful pattern. It’s almost too pretty to eat! Pickled red ginger and dried bonito flakes are served on the side for you to add to your liking. 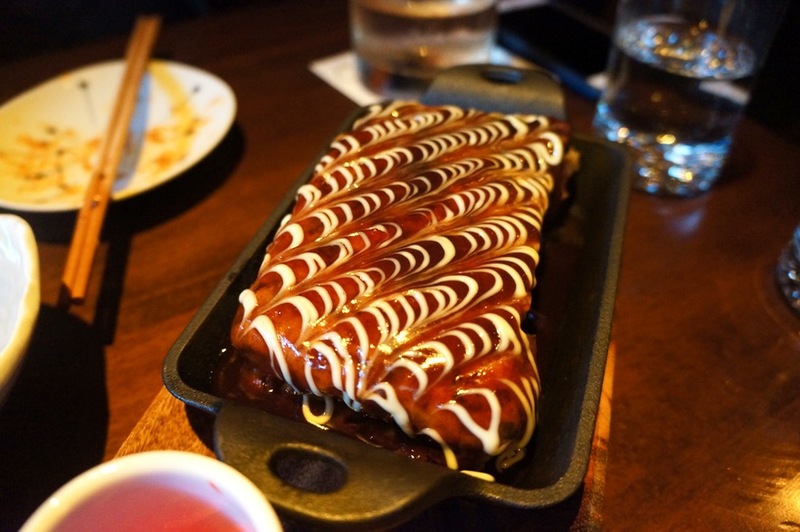 The okonomiyaki was double the thickness of what we’re used to – like a deep dish okonomiyaki. So needless to say, it’s very filling and definitely something meant to share. We ordered the classic version and really enjoyed it.